Now here's one that puzzled us a great deal. "Acclat" is the pen name of the problemist credited with today's Checker School entry, but we turned up little on the word itself. We found two companies, Acclat Famous Urban Apparel, seemingly not famous at all, and Acclat Business Solutions, at least equally obscure, but little else of any interest. Acclat sounds French, but the French word is really éclat as in the common expression éclat de rire, a peal of laughter. But acclat? It will remain a mystery. Hopefully our problem position, shown below, will prove far less mysterious. We'd say that this one, while certainly not easy, is at least quite a little bit easier than most Checker School selections, and you're likely to have your own éclat de rire when you see the solution. Still, checkers is no laughing matter, so keep a straight face and solve the problem, and then click on Read More for the solution, a sample game, and detailed notes. As is customary, the solution, sample game and lettered notes are taken from Ben Boland's Famous Positions in the Game of Checkers. Numbered notes are by the editor with the assistance of the world-class KingsRow computer engine with the 10-piece endgame database, generously donated by author Ed Gilbert. 15-18---A, 24-19, 21-17, 20-24---B, 17-14, 24-28, 14-9, 19-24, 9-6, 24-20, 6-2, 20-16, 2-7, 16-19, 7-10, 19-24---4, 10-15, 24-20, 18-23, 20-24, 23-19, 24-20, 19-24, 20-27, 32-23, 28-32, 23-19, 32-27, 15-18*, 27-24, 19-15, 24-19, 15-10, 19-24, 10-6, 24-27, 6-2, 27-24, 2-7, 24-19, 7-10, 19-24, 10-15, 24-27, 15-19, 27-32, 18-23, 32-28, 23-27, 28-32, 19-23. White Wins---5. Game: 11-15, 23-19, 8-11, 22-17, 15-18, 19-15, 10-19, 24-8, 4-11, 26-22, 11-15, 28-24, 12-16---D, 30-26, 7-11---1, 17-14, 9-13---2, 26-23, 13-17, 22-13, 18-22, 25-18, 15-22, 13-9, 6-13, 24-19, 16-20, 23-18, 1-6, 19-15---E, 3-8---F,3, 14-10, 6-9, 10-7, 22-25, 29-22, 9-14, 18-9, 11-25, 7-3, 5-14, 3-12, 25-29, 12-16, 29-25, 16-19, 25-22, 19-15, 22-25, 31-26, 2-6, 26-23, 25-22, 23-19, 22-26, 19-16, 13-17, 16-11, 17-22, 11-7, 22-25, 7-2, 6-9, 2-6, 9-13, 6-9, 26-31, 9-18, 31-24, 18-22, 25-30. Forms above position. J. Robertson, Center, Var. 18, in his "Guide." A---To correct Robertson who played; 21-17, 30-25---C, 22-29, 13-22, 15-18, 22-26, 18-23, 26-30, 32-28. White Wins. B---19-16, 17-14, 16-11, 14-10, 11-16, 10-7, 16-11, 7-2, 11-16, 2-7, 16-19, 7-10, 19-16, 10-15, 20-24, 15-10, 16-19, 10-14, 24-28, 14-10, 19-24, 10-15, 24-20, 15-19, 20-24, 18-15, 24-20, 19-24. White Wins. C---But J. MacFarlane in No. 2, the Draughts Player's Quarterly Review, Center Game, Var. 2, shows a draw by 30-26, 22-31, 13-22, etc. Drawn. D---7-10, 30-26, 9-14, 24-20 (or 24-19 Robertson), 5-9, 17-13, 3-7, 26-23, 12-16, 20-11, 7-16, 31-26, 1-5, 32-28, 2-7, 22-17, 16-20, 26-22, 7-11, etc. Drawn. Dr. A. Schaefer. E---Given by Robertson to correct 27-23 by R. A. Davis, to draw, in Janvier's "Anderson," Var. 5 at 21st move. F---6-9, 15-8, 3-12, 14-10, 9-14, 18-9, 5-14, 27-23, 13-17, 31-27, 22-26, 10-6, 2-9, 23-18. White Wins. Dr. Schaefer. 2---A very weak move, perhaps losing; 2-7 is best. 3---Seals White's doom; 11-16 would have held on longer. 4---The White king on 22 holds the man on 13 and the king on 30, while the White king on 18 keeps the Black king on 24 from approaching. Black is helpless. 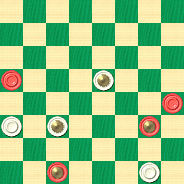 5---The solution looks long but the win is very methodical. The key is to get the first move right! The above position by "Acclat," may be found as No. 15, in the "International Draughts Magazine," Feb. 1889, Vol. 2.